Blonde Ambition: Foodie Friday - Food Prep! Food Prep – it can be as simple or as complex as you want it to be. You can create masterpiece display lunches, or you can work out what macros your body needs for the day and create a simple menu to accomplish the task – the latter is pretty much how my mind works. 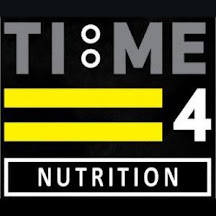 However you approach the task, if you want to be successful in a health and fitness journey I deem it essential, a ritual addition to your week. I am a lazy shopper – doesn’t matter if it’s clothes, makeup, food – if I can buy it online I will avoid queuing at a store for sure! So I usually plan what I am eating the Wednesday before, order my food to be delivered when I get home on a Friday night – then depending on what I have planned for the weekend I will pick a slot to get prepping. Usually a Sunday morning, but as I said if I’m busy on the Sunday I will quite often get my mass cook on the Saturday night – I know right… Punk stuff!! Now.. I’m a simple girl, and I will quite happily eat the same or similar meals for lunch 4-5 days a week, it doesn’t bother me but what I will do is cook a batch of chicken, chicken sausages, steak bits so I have a little bit of choice and 80% of the time I will bake the sausages, marinade the chicken and beef and then fry that in coconut oil. Simples right? Next on the list is my complex carbs – I tend to keep oats at work for breakfast and most of the time I eat just 45g of rolled oats cooked with skimmed or almond milk and I eat that pretty much as soon as I get to work. 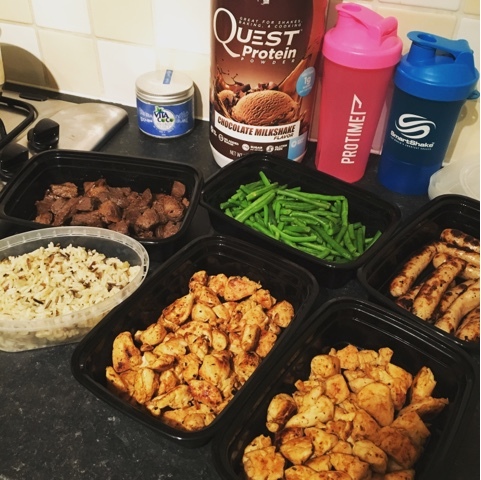 I train mostly in the mornings at the moment so on the way to work I have a high protein drink, my favourite being a double scoop of Quest Nutritions chocolate milkshake – ermagawd if you haven’t tried it yet you don’t know what you are missing!! Next.. mid morning snack – this is usually my chicken sausages and often I will have some hard boiled eggs on the side. Lunch is usually either chicken or beef, occasionally salmon I just don’t find cooked ahead salmon smells very nice after day 1… in fact it stanks!!! I’ll have this with some form of green vegetable and on a training day – complex carbs – this week was rice. This pretty much keeps me full for the afternoon and then I will have dinner when I get home (whatever I fancy within my macro requirements, this is when I mostly eat fish.) and I always try to have a protein shake right before I go to bed to assist my body in muscle recovery and maintenance. I pack all of my foods separately in containers and refridgerate – packing my six pack fitness Tupperware the night before I plan to eat. Et voila!! Once you get into the swing of food prepping, and have organised the process in your mind, it really is the simplest, most efficient way to ensure you stay on track with your goals during the week. I think it takes me about an hour of smashing through and it’s done.